This web page contains articles and case summaries on the law of damages. Very few if any law books are so absolutely clear and readable, in fact I can honestly say I have never come across a law book that was so concise and interesting and readable on the one hand and yet so advanced and to the point and instructive on the other: Paul Jensen, FRICS, FCIArb, Barrister, May 25 1999. All you technical arbitrators and adjuicators and all you consultants up to your necks in disputomania – do invest in this great little book. Dunn is a construction industry man who has taken the important principles surrounding damages and makes them easy to understand: Tony Bingham, FCIArb, Barrister, Building Magazine, September 3 1999, p51. …in common law countries such as the US, UK, Australia and Canada, where court judgments are (in addition to statute) an important source of law, a huge body of case law has developed over centuries of law reporting … Particularly from the viewpoint of claims people in civil law countries, a compact analysis of the law of damages is much needed. Stewart Dunn has written and published such a book. 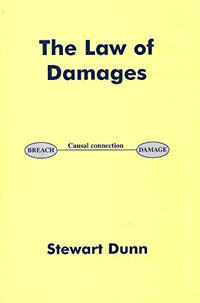 “The Law of Damages” is a 103 page, easy-to-read, systematic analysis of the law of damages in English law. It should be a manual for those who handle claims arising in contract or in tort. It may also help preclude certain types of claims they face in day-to-day transactions so that they could avoid unnecessary costs and time. Above all it is a compact book, a feature of particular importance to non-native speakers: Takao TATEISHI – Editor, Bulletin of the Japan Shipping Exchange, Vol 40, February 2000.